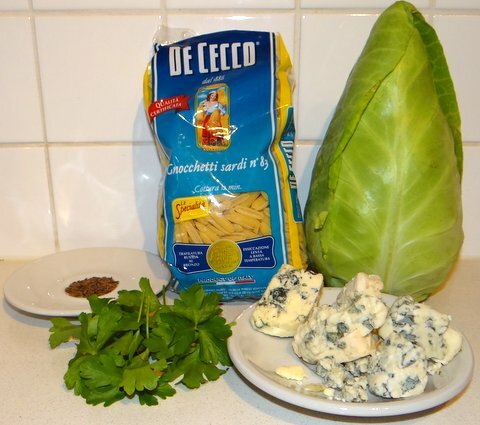 After the success with the parsnip ragù from $35 a week I decided to try her recipe for pasta with cabbage and gorgonzola well. I’m always looking for new ways to use vegetables, especially if I don’t eat them very often like cabbage. 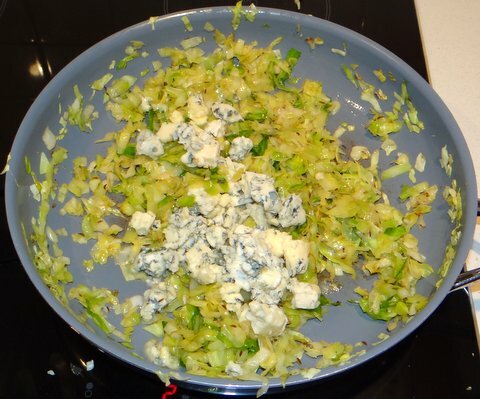 This recipe is very simple, quick and tasty, especially if you like blue cheese because that’s what it tastes like! With pasta dishes I always try to match the texture of the pasta with the texture of the sauce (or create a contrast on purpose). Since this sauce has a ‘fine’ texture, I decided to use gnocchetti rather than penne. Cook the pasta al dente in salted boiling water for the time indicated on the package. Meanwhile, sauté the cabbage with the caraway seeds in the olive oil until it starts to brown. Lower the heat and add the cheese. Stir to melt. When the pasta is ready, reserve some cooking water. Drain the pasta and add to the cabbage. Toss to mix. Add a bit of the reserved cooking water if the mixture turns out too dry. Taste and adjusted the seasoning with salt and freshly ground black pepper. 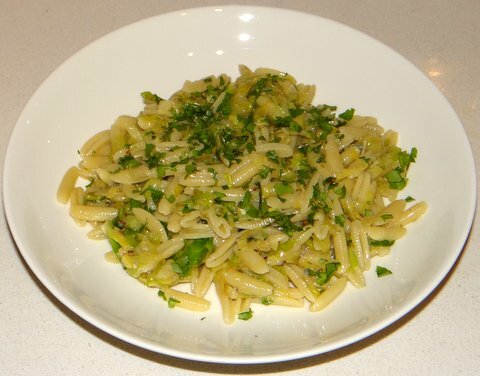 Serve on preheated plates, sprinkled with parsley. I recently made Pasta with cabbage, a vegetable I don’t usually associate with pasta, and it was so delicious. Instead of blue cheese, I just added Parmesan and I was really impressed how the caramelized cabbage married so well with wholewheat pasta. Will give your recipe a try. By the way, I am Italian (and a chef) and I am impressed by your knowledge of Italian food. You are right about not associating cabbage and pasta. The only traditional pasta dish with cabbage that I know of is Pizzoccheri alla Valtellinese, made with savoy cabbage (verza). Stefan, you just touched on one of my very favourite dishes ever! And so hard to find on menus unless you are in the Italian Alps. When I discovered it in an Italian restaurant here in LA, I nearly fell over! I can imagine! I am planning to make pizzoccheri next week (and blog about that, obviously), as soon as I’ve found the proper cheese for it (Valtellina Casera). There is a cheese shop about half an hour from here that should have it. By the way, have you ever been to Biba’s in Sacramento? I’ve initially learned to cook from her books, and it’s the only (mostly) authentic Italian restaurant I’ve been to in the US (I haven’t been to that many though, probably about 2 dozen or so in Chicago, NYC, Florida and one in Atlanta where they wanted to serve grated parmigiano on spaghetti alle vongole…).